Why women couldn't look away from last night's episode of MAFS. When you read this dissection of exactly why we are all perhaps so invested in the drama of reality TV, something not only rings true, it sits a bit…uncomfortably. Why the hell would we enjoy watching other women be socially manipulated? 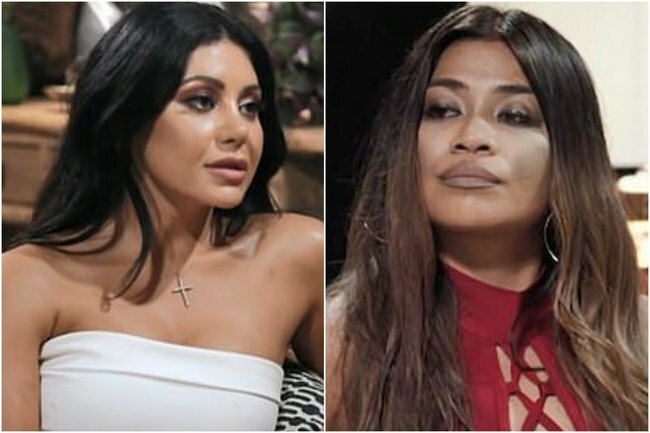 Are we bad people for sitting back with our popcorn as Martha poured wine on Cyrell’s head last night in a spectacular crescendo to what has been an entire Married At First Sight season based around… women fighting other women? As psychologist at The Relationship Room Rachel Voysey tells The Quicky, there is in fact a reason we are so glued to the screen. Listen to the full chat on The Quicky. Post continues after podcast. “There’s this fascination to watch other women in conflict, because we feel that helps us understand better what we have experienced in our past. “Most women have experienced conflict from other women, and it’s often hard to make sense of. So watching it in other women helps us understand our own experience. “Sometimes it helps us process past negative experiences. It’s like a group therapy experience of watching other women to help us process our own past,” she explained. Editor and writer at Mamamia Jessie Stephens is knee deep in the drama of Married At First Sight. She and her twin sister Clare have spent every single episode dissecting the drama in their recaps (which you can find here). When it comes to women fighting with other women on the show, Jessie is honest; “I find it exciting… so exciting, and that’s reflected in the ratings. We can see the engagement in the recaps that we write when there has been that kind of fighting. “It’s sort of like in our day to day lives we suppress anger but when we see it on TV there’s something vindicating and almost liberating about it. I don’t get that from the men fighting,” she tells Quicky host Claire Murphy. Ms Voysey says it all goes back to evolution, and how men and women are biologically built differently. “When you look at us from a biological perspective, in how we developed, men are most of the time physically stronger and able to defend and fight in a physical way. Women aren’t. We can do it of course, but from an evolutionary perspective – men are more physical, and they also contain a higher amount of testosterone which leads you into a quicker action type of state,” she explained. “Women also have children around us. They have to be softer and more protective as a group, so women had to learn to do things in a more subtle way to keep themselves competitive. The way women evolutionarily stayed competitive to get the guy, or get the job or win the prize is to do something more subtle – we don’t tend to come straight up into the conflict with aggressive tendencies,” Ms Voysey continued. If you think back to the fights on MAFS, it always starts small. A comment to a friend, voicing a niggle to a partner about another woman. It grows and manifests slowly. This was the result of weeks of build up. &apos;Cat fight culture&apos; at its worst. Image: Nine. "There are more subtle undercurrents in the way women undertake conflict, at least in the beginning stages. It then escalates as we see on these TV shows to throwing and yelling and much more overt type of things," said Ms Voysey. As Jessie explains, their fights are more nuanced and more complicated than the men. We as women can see a part of ourselves in them. "No, it&apos;s not healthy," she adds. "But there&apos;s something in it....it works because it appeals to something deep within us." "In these television shows they aren&apos;t demonstrating anything better... you aren&apos;t learning how to better communicate, or talk about problems in a way you&apos;re going to move forward," she says. She uses rejection as an example to unpack our &apos;primitive&apos; approach to feelings. "If you were kicked out, you were out of the tribe and you probably wouldn&apos;t survive," she says of our ancestors. But in today&apos;s day and age, we will more than survive. "In modern society there&apos;s no reason for women to treat other women this way. "There&apos;s room at the top for all of us, we are all different we all bring something different and useful and positive," said Ms Voysey.